Sorry for the late posting; I have been literally 'holding the baby' this evening - my friends 7 week old little girl, called Grace. Todays card is 'The Page of Wands' - 'Doctor Lock'. This is another one of the cards that I glanced over but have not warmed to in the deck - the other, so far, was the 'Page of Coins'. This guy seems very old looking to me, which is so different from the youthful pages in other decks. 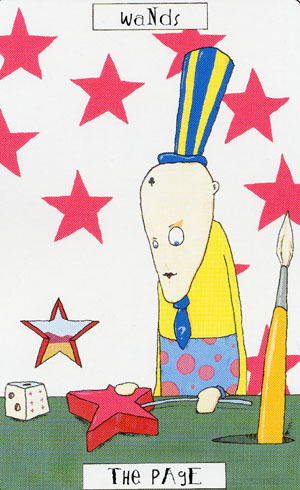 He has a long head and high hat - striped, in yellow and blue. He holds a singular wand with a large pink star at it's top. He rests a hand on the star. His tie wears a question mark and his forehead wears some kind of 'club' tattoo. On the table lies a dice, and from the hole, a very large paintbrush. I have never noticed before, that one of the stars on the wall behind him is cut out and a little of the view outside can be seen. "This is Doctor Lock, the Page of Wands, a philosopher with an open mind, who is full of good intentions. Doctor Lock confronts the limitations of his existing wand and romoves a larger star from the wall behind him. This enables him to expand his wand and thereby increase the scope of his own horizons, opening himself up to new people and fresh ideas. Doctor Lock represents exciting new horizonsand possibilities. Reversed: Bad intentions, ignorant and rude." How do you all feel about this page? I look forward to your replies. He has warmed a little bit but he still feels a little stale inj comparisson to my more favourable characters. I do like the star taken from the wall for his wand. That is a nice detail. This card is for the 7th; I got the date wrong. First, Doctor Lock makes me think of Professor Key; like the E.A. Poe story "Dr. Tar and Professor Feather", they just seem to go together. So I think he is looking for the key to unlocking his further potential, and has found it in a new and bigger wand. Perhaps there is undiscovered potential in that paint brush, which is aligned in front of that star on the wall so that it looks like a magic wand as well. I looked at the Ace of wands and the other wand court cards and I find the repetition of the club interesting. Perhaps it means that wand energy that isn't grounded will dissipate. That it is there to be used for concrete objectives. The King has a huge club and a very small wand. Perhaps with him a little inspiration can move mountains. Doctor Lock goes for the bigger wand. Maybe he realizes he has a lot of expanding to do and much to experience before he can be like Ludwig. Also, the club's positions are interesting. The King's is on his gut, the Queen's on the elbow of the arm she probably paints with, the Knight's at the apex of the heart, and Dr. Lock's on his forehead, or third eye. There is also the question mark and the die. I think he is willing to act on his inspirations, intuitions and hunches; to take chances and see what happens. Edited to add: now that I've actually looked up the Poe story, the correct title is "The System of Doctor Tarr and Professor Fether". I rather like Docter Lock Somthing about the name i guess. The gap in his wall makes me think that he could be a little TO openminded and trusting. Every one can come in. But his name is telling that he too can come in anywere. His mind and his personallity make him able to go eveywere and earn the trust of everyone. Sizing up the situation, Dr. Lock is pondering the question of whether three-dimensional stars make good objects to stick on wands. Having excised this particular beauty from the wall, thus enabling him to see the light of day, his concept was originally for a necklace pendant but he felt too much shine on the neck might not enhance his enormous eye. Tasteful jewellery is one thing, but when it overrides the natural attributes of the wearer, then it's time to paint the world with a different brush. Dr. Lock has solved the perennial problem of wearing polka dots and stripes together, by putting the stripes on a stovepipe hat, separated from the polka dots by a canary yellow shirt and tasteful blue tie. Not the luck of the dice, but one's personal choice and creativity, tying in nicely with his ongoing ruminations on the contrast of equilibrium and pre-established harmony. Indeed, Dr. Lock is a doctor of philosophy, and as he wrangles with questions of fashion and balance, he considers Leonhard Euler's Introduction to the Analysis of Infinity while viewing the mountain scenery from his new window. His is a process philosophy which prevents him from being mired in probability, and leaves him free to embrace speculative argument. He currently fancies trying to paint the reality of axiological ethics on his tie, but needs a liner brush rather than a squirrel brush to do so. Oh well, back to the drawing board. I was trying to think of something clever for these dice but couldn't. I like your ideas though. The Page of Wands, Doctor Lock, has just removed a star from the wall behind him and now investigates how it looks on his wand. What a good idea of him! I don’t think the same thought would occur to many people. Doc Lock seems to be a very innovative guy with some really original and refreshing ideas. I get the impression he very much thinks outside the box. I think he is willing to act on his inspirations, intuitions and hunches; to take chances and see what happens. The fact that he’s searching for a star to put on his wand may shows that he’s still trying to find his way through life (the question mark on his tie could show the same thing). By pulling out that star from the wall, Doc Lock has revealed a landscape that would otherwise have remained hidden – isn’t that wonderful? By experimenting and trying out new things, he opens himself to new horizons and new possibilities! I think he sees things others don’t. It also makes me feel that this Page has an interrogative nature and is always very busy, and doesn’t like to be locked between four walls for very long. He’s a free spirit and doesn’t like limitations or restrictive rules. His high hat may show that he has high ambitions. The stripes kinda look like rays radiating from his head, and may show his unique, original way of thinking and his luminous, charismatic personality. I had no clue about his dice, but when I read this thread I found a terrific interpretation by Maan! Dr. Lock has solved the perennial problem of wearing polka dots and stripes together, by putting the stripes on a stovepipe hat, separated from the polka dots by a canary yellow shirt and tasteful blue tie. Dr. Lock is one of my favourites in the deck. No one beats Bundy but he comes verrrrry close. If I hadn't recently lost my old hard drive, I would have told you about his party boy habits, but I can't remember what I said, which many would consider merciful. Dr. Lock and I are planning to read Lucretius together once he gets this sticky wand problem ironed out. . . and HE knows what a mandala is, having studied, during an episode of youthful folly, Jung's particular enthusiasm on the subject. We are lucky Lock didn't embrace psychology, for who else could wrestle with Alexius Meinong's theory of objects and make it sound sensible. Who else but the Doctor? The world is a better place for his keen eye and perception.